Tagua (tah-gwah) is a plant alternative to ivory. A large, hard nut that can be cut, shaped and sculpted into. 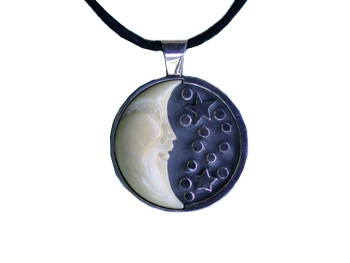 Get this beautiful Tagua half moon face in a sterling silver extra large with two stars design pendant. It comes with 17.5'' black silk cord with 0.5 in clasp. Designed by Sabine Koehring and made in Indonesia. About 10g in weight.